The Islamic State is “Barbaric,” But What About the US and Israel? 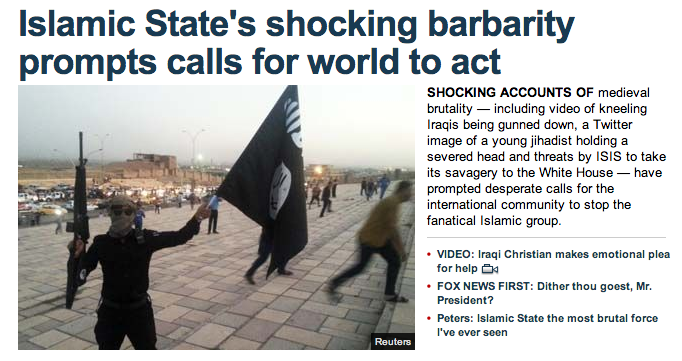 An August 12th headline from Fox News read “Islamic State’s shocking barbarity prompts call for world to act.” The sub-heading of the article went on to claim that this “fanatical Islamic group” uses “medieval brutality” and “savagery” against its enemies by severing people’s’ heads and mowing down helpless civilians with guns at point-blank range. Fox News is right. The Islamic State is a “brutal” organization. By definition, the word “brutal” means “extreme cruelty” or “mercilessness.” Obviously, chopping off the heads of Christians because they don’t share your religious beliefs is horrible and inhumane. Nobody doubts that. But let us not kid ourselves. Fox News is not “fair and balanced.” They would never publish the headline “The US military’s shocking barbarity” or “The Israeli military’s shocking barbarity” even though these two organizations are, by definition, barbaric. The Israeli military used white phosphorous, a nasty chemical weapon, on the Palestinian civilian population between 2009 and 2012. The Israeli Defense Force has admitted to this war crime. According to the Daily Mail, white phosphorous “causes skin to melt away from the bone and can break down a victim’s jawbone.” Hardly anything is more cruel than dropping this kind of chemical weapon on babies, children, and women. The US military used white phosphorous, also known as “Willie Pete,” during the Vietnam War. 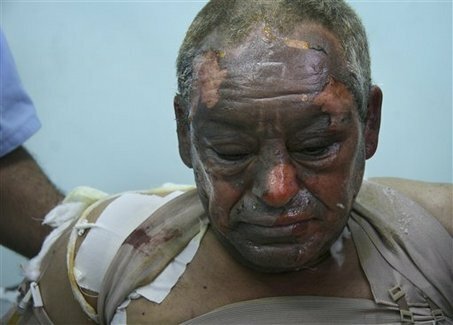 Decades later, witness accounts claimed that the US military used white phosphorous in Fallujah during the Iraq War, where a significant civilian population suffered horrendous burns. The US military has also recently used depleted uranium, another ruthless chemical weapon, in Fallujah. Depleted uranium has caused a high rate of congenital malformation among the civilian population of Iraq. So, the Islamic State chops off people’s’ heads and mows down people at point-blank range with assault weapons. The US and Israeli military drop chemical weapons on civilian populations of Palestine and Iraq. These are all barbaric acts because they inflict extreme cruelty on civilian populations. Let’s not get it twisted.